I have well over a thousand drawings on this blog and I thought it would be interesting to revisit some blog posts from previous years over the next couple of weeks. There are so many and I thought it would be nice for me to pick some of my favourites and maybe ones you haven’t seen before. I started the blog back in August 2010 when Gruff was only nine months old, Evie was two and Millie seven. We hadn’t even got Bonnie then and life was very much a day to day battle to find a few hours decent sleep! 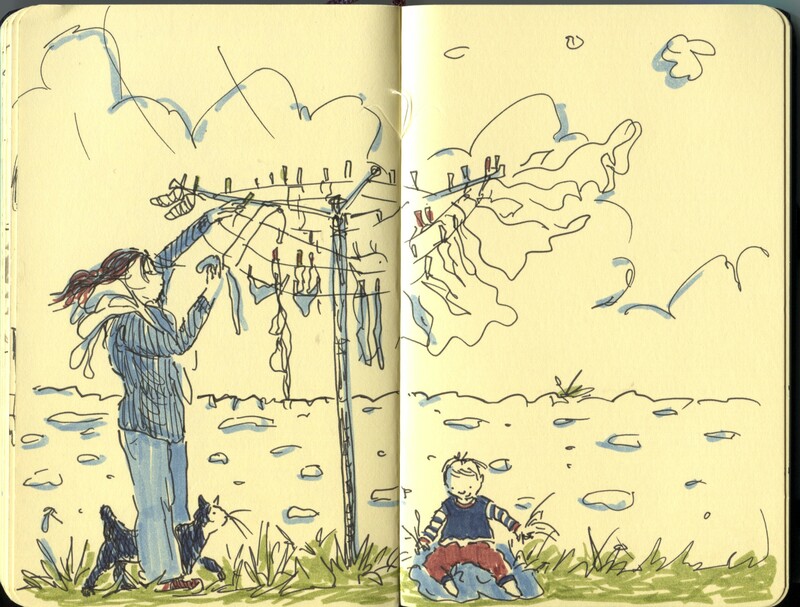 The blog was and still is a way of capturing my family’s day to day in drawn form. I use pen and I draw straight into my sketchbook. My drawing style has evolved since 2010 but alas my washing pile has too! I hope you enjoy the compilations! Posted on August 7, 2015, in Uncategorized and tagged Children, Doodlemum, Drawing, Drawings, Family, Humour, Illustration, Life, Pen and Ink, Sketchbook. Bookmark the permalink. 26 Comments. awesome. somehow its a bit more meaningful and personal than just capturing another family picture. i’m sure it will be meaningful for generations to come. thanks for answering! Great idea to revisit the early days. It would be interesting to see a side by side of the children then and now – they have really grown up since the beginnings of the blog. Love your blog and your drawings! Wonderful! It looks like an illustration from a really interesting children’s book. Well so there is! Silly me! Your drawings are very nice. I like them very much. Best regards. Great idea! It’ll be fun to see what sketches you choose. I love how this one is a two-page spread. I love your drawing style! You can almost hear the wind can’t you? The little girl taking no notice whatsoever,intent on her playing. Lovely picture x. Your drawings inspired me to start drawing fellow passengers on my commute to London. I have filled two and a half notebooks and they will always be a lovely memory. Thank you. I enjoy looking at your posts every morning but never comment; your reflective post has prompted me to say a big thank you for all the pleasure your drawings and comments have given me since I started following your blog. Congratulations on your 5-year-jubilee! I started following you when I started doing research on infant cognition, looking for nice websites to post about on our lab blog. In the end I never got round to posting about you, because Gruff was already past the baby stage when I found you, but I did bookmark your blog and visit it almost every day as a lovely little work break 🙂 I love seeing your depictions of family life & the animals; brings back memories of my own childhood and our chicken ensemble, and makes me feel connected to someone living a life that I hope my life will resemble some day! I Many thanks for sharing! I have certainly enjoyed following your blog! Doodlemum – thank you , you are an inspiration. Loving your beautiful sketches. You have a great talent, being used in a beautiful way. Not only are you giving many people much pleasure in enjoying your sketches now.. but creating a wonderful store of memories for you children. God bless you and your family. These are lovely. Made me smile and reminded me of my own times with my children. Love your style.